One of the most beautiful of all the zodiacal constellations is now visible, emerging from beyond the southeast horizon as darkness falls. This is Scorpius, the scorpion. Here is a star pattern that really does look like what it supposedly represents: a scorpion, formed by a number of fairly bright stars. Its body is formed by the upper stars of this star pattern; its tail slants toward the horizon, then curves to the left and upward, a fine stream of stars ending in a wide pair that marks the Scorpion's stinger. George Lovi, a well-known astronomy lecturer and author, used to say that it always bothered him that a striking star pattern such as Scorpius was made to represent "a lowly, creepy-crawly thing that has few friends." 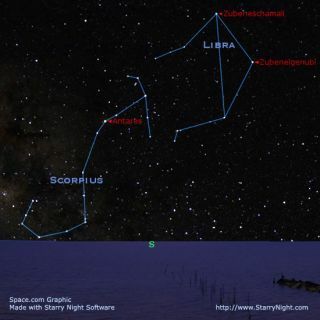 Scorpius is a constellation that can be best appreciated by southern stargazers. Those who live in the far northern United States, southern Canada or the British Isles will have part or even all of its tail hidden below the southern horizon. As one progresses farther south, the Scorpion slowly climbs in the southern sky. Those stargazers who live in Australia, New Zealand, South Africa, northern Argentina, Uruguay, most of Brazil, northern Chile and southern Peru have Scorpius directly overhead. The Milky Way passes through the lower extremities of the Scorpion. Here clouds of stars and dark interstellar dust combine in a bewildering array as seen through binoculars and telescopes. On Monday evening (July 11), take note of a bright star displaying a distinct reddish hue sitting directly under the waxing gibbous moon. That's the Scorpion's brightest star, first-magnitude Antares. On astronomers' brightness scale, smaller numbers represent brighter objects, with negative numbers being the brightest of all. Antares ranks as the 15th brightest star in the sky. To the ancients, Antares' distinctive red color suggested the planet Mars and its very name literally means "The Rival of Ares," Ares being the Greek name for the God of War. Actually, if you've ever seen Mars in the sky, you'll see that it really glows a yellowish-orange; so in terms of appearing to shine with a ruddy glow, then, Antares is actually the winner. Henry Neely, a long-time lecturer at New York's Hayden Planetarium, would often mention to his audiences that during the time of Confucius, the Chinese called this star Ta Ho, "The Great Fire." Antares is a cool, red supergiant star, about 604 light-years away. It is 9,000 times more luminous and about 700 times the diameter of our sun. Consider this: If our sun were shrunk down to the size of a baseball, Antares would be a globe measuring nearly 146 feet in diameter! If our solar system were centered on Antares, the orbit of our Earth would easily fit within this star. Yet, despite these impressive statistics, it should be noted that the overall density of Antares is less than one-millionth that of the sun. Antares is also relatively cool as stars go, only about 6,500 degrees Fahrenheit, compared with 11,000 degrees for the sun. Its low temperature accounts for its ruddy color. It also has a tiny, very hot companion, bluish-white in color, which has been described by many observers as appearing as "a little spark of glittering emerald" because of its proximity and contrast to reddish Antares. The pair orbit each other about once every 900 years, separated by a distance of about 500 times Earth's distance from the sun. Scorpions have two large claws in front, but this one seems to have had his claws clipped; they were cut off to form the constellation of Libra. The star Zubenelgenubi was once considered to be the southern claw of Scorpius. The northern claw was marked by the star Zubeneschamali. The Romans probably decided that there should be 12 constellations in the zodiac, instead of 11, so they made the two claws of Scorpius into the arms of Libra, the Balance. But long ago, Libra actually belonged to Scorpius. A common misconception is that the constellation is called Scorpio. Actually, the currently accepted name of this star formation is Scorpius. It is mainly astrologers, and some older astronomy books, who use the term Scorpio for labeling the zodiacal sign.